Quality reproduction of drain plug and brass gasket used on Ironhead Sportster transmission, motor case, oil tank and Big Twin 1937-1986 transmission. The thread pitch is 1/2" X 13 Thread. Replaces OEM # 707. 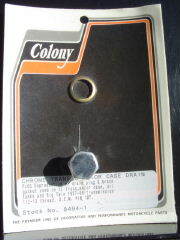 Colony Stock #'s 8494-1 and 8495-1.